I personally measure voltages everytime. But removing safety switch doesnt help me isolate just Ackomp or heater so i can drive car. That maintanance had hurries today... and they left car outside. I might to remove myself fuses of Ackomressor and heater then. Ready for them. Maybe DTC reset itself maybe not. If its up to those. Do you think its easy to remove fuses with Jack and secure for Jack. Does it need special equipment? 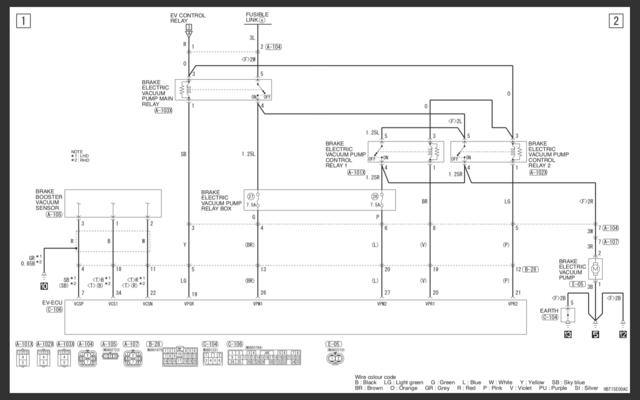 Ok learned all HV side systems and components this evening 6h reading again and again with looking Drawings. 2. Also QC relay is with 12v coil. Hmm could it be QC relay have arhced bad and thats why car cant have Ready on.. ill try anyway to remove QC relay also. Because this all happened on DC starting. Need to measure voltage from chademo port witj caution. Does HV side boot helped anyone on any error? Ill try that tomorrow by key out wait 1 min remove 12v wait 5 min remove safery switch. If those fuxing seem to take too much money and time i will change Inverter to DMOC 445 we have those many nearby here. Its 80kw inverter and main fuse in Miev is 280A so 242a to inverter is ok. I wont add low rpm Torgue but this 80kw will keep 200NM lot of higher RPM than 43kw. Maybe redusion gear can use some more low Torque but its no need raise that. Also max rpm will be 30% higher if need somewhere..
336v Is max recommended battery nominal for Dmoc 445 so 330V is just most perfect in Miev. Hate those errors stop driving..
Last edited by Bjron on Sat Nov 17, 2018 9:31 am, edited 1 time in total. I measured QC relay did close it swich when 12v applied. So relay was ok. There was no car ground on any of relay 4x pins also not +12v on any pins. Plus was 330ohm to ground. 0.7v diode on relay was ok.
Maybe i needed ground extra battery to get s330v to chademo connector. Do you think my 280a main fuse might be broken? It appears that your car has more issues than just the On Board Charrger. i would like to suggest and recommend that you please start a new thread for your own car--this will help focus attention on troubleshooting and solving your numerous issues. In addition i would prefer that misinformation not clutter up this thread. The brake vacuum pump does not operate on the pack HV, as shown in the wiring diagram. Thx Kiev for reply. Mostly wanted reply from u also. Yea sorry u are right. There are 4.fuse on fuse list and it is saying its HV fuse for dcdc on same row than fuses 27 and 28 for brake vacuum. But i readed the hole row.. my fault. I needed scroll phone screen and missed some info. Hmm then it must be Ev-ecu or EV control relay because car is not doing vacuum even hitting brake pedal many times. With key on running state without ready mode. Does vacuum need ready mode? Its kind of crazy if it need. Thx Kiev this helped much. Ok plastic bottom removed and i found out there are quick connectors for Heater and AC kompressor. So no need open bottom fusebox yet. Ill remove connectors on monday and ask just for DTC reset and lets hope its fixed then. Damn there wasnot info anywhere that they have quick connectors. Our vacuum pump is still operating even though the car does not go ready, and there is no voltage at the motor control unit. Short update: disconnect just heater and clear codes didnt came back. Tryed 5 times without heater then 3 times with heater and heater seemed be faulty if its HV connected. Then i let car be on ready mode for 15min. And turn it off and in 15sec back on and fault code was back even heater was disconnected .. I didnt try with AC compressor also disconnected yet. But dcdc disconnect didnt helped. Ill try tomorrow with also Ac comp HV disconnected. Those maintenance garage dudes are best. They are ok to come to reset fault codes. I gived them little help money for that. On Czero car seems to need ready mode to start vacuum pump. It worked ok in ready mode. Found this diagram showing the quick disconnects for the pack, labelled as "11" in this picture. The two at the front are for the AC and heater, the one at the rear goes to the bottom plenum of the MCU.